Program 106: Elder Wisdom | Wisdom of the Elders, Inc. In this chapter of Elder Wisdom, Barbara Roberts introduces us to several members of the Monacan nation. Speaking to us from the open beamed, high ceilinged room that serves as their community center, the gentle cadences of Monacan life are revealed. Growing up in apple orchards in Virginia’s Blue Ridge Mountains is typical of a Monacan life. The springtime petals fall and cover the ground like a white blanket with a pinkish hue. The buds give way to luscious, juicy fruit that come ready for harvest just before the leaves begin to turn to their vibrant colors of yellow, red and gold. The setting inspires some to poetry. Where they make apple butter. Descending the hillsides with dusk. No green Granny Smiths, no Empires. As leaves begin to yellow in the darkness. They need one quart of apples for every half pint. That pare and pare again. This is life on Bear Mountain, the focal point of Monacan culture where many ancestors are laid to rest, where the Monacan are working to preserve their culture just as they’ve worked to preserve the harvest through the making of apple butter. As a way of sharing their traditions, the Monacan are in the process of creating a replica of a Monacan village that’s been open to the public for a few years now. The village is near a natural bridge. And just as the village is a way to preserve Monacan culture, the natural bridge once played a role in preserving Monacan survival. Legend has it that the Monacan were in a desperate battle with enemy tribes. As the enemy fiercely descended on the Monacan warriors, they found themselves backed against a great canyon – nowhere to go. The women and children huddled together and prayed. Warriors fought back trying to hold the enemy at bay. Then, mysteriously, out of the mist, a great stone bridge appeared. The women and children escaped to safety and the battle was won. The natural bridge in Virginia is known as one of the seven wonders of the modern world. For the Monacan, it’s a sacred site. They chose to make their home some 35 miles east of that bridge on Bear Mountain. Bear Mountain is our, what we call our spiritual center. It’s a fairly small mountain. It’s one of the foothills before you get to the bigger mountains, which are still very small compared to the Rockies! But I like to remind people that these are the oldest mountains in the world, and so they’re kind of worn down and bent over, you know, (laughter) kind of like an elder, in a way. The elders are treasured by the Monacan because they’re seen as a tangible link to a living heritage. Hattie Hamilton is a tribal elder. She remembers bountiful gardens of the three sister crops: corn, beans and squash. Hamilton says they never went hungry; and they never let anybody else go hungry either. Daddy was a farmer. We always had our own calves, for milk, you know, and butter, had chickens for eggs, and all. Had our own gardens and everything. Killed our own hogs. Cured our hams and everything. And we fed so many people! My mother, my mother fed mo’ people, I guess, than any other person in, in Amherst. I don’t know if it ever was a meal at our house was eaten with just our family. It was always somebody dropping’ by, you know, happen t’ drop by at mealtime and we always have plenty, you know, for everybody. The tie to the land is a vital part of the Monacan psyche. Drawing food from the soil is as natural to the Monacan as a walk down the produce aisle of a grocery store. Hamilton also says wild meat in the woods sustained her people and still does. Oh yes. We always went hunt the woods, still hunt the mushrooms, but y’ can’t seem t’ find many of ’em now. My daddy liked t’ hunt. My daddy used t’ go out ‘n kill squirrels ‘n things f’ us. I’ve got a son now that’s hunting crazy. He lives to hunt. Turkey season’s in right now, and her brother ‘n him’s going hunting ever morning, I reckon. My dad never did hunt much, other than, you know, squirrels. He never did– and rabbits, now ‘n then he would kill a rabbit, but mostly squirrels, ’cause my mother loved squirrel and squirrel gravy. She loved the squirrel. Chief Branham’s mother, Lacey, talks with relish about the varieties of traditional game. When we was kids, we used t’ have t’ make box traps t’ catch rabbits in. And momma would cook them (chuckle). And we would eat deer meat, ‘n you know, rabbit meat, ground hog. Turtles. You gotta cut ’em at the shell, you know. That’s the way you get, get the meat out, you know. But it’s good meat. It’s good meat. And each piece of it, uh, tastes different. Yeah, we’ve eat a many one of those. (laughs). The woods and all other forms of nature are completely interwoven with the everyday life of the Monacan. A closeness to nature is such an integral part of Monacan culture that a dialog actually develops. Karenne Wood says it’s a form of non-verbal communication, a real exchange. But what I’m also talking about is a very deep sense of an everyday kind of religious experience – maybe not religious, maybe just “spiritual” is the best way to describe it – where you understand your place in the world? A specific place in a land that interacts with you? You know? So that what I say is “you touch a tree and the tree touches you back”. It’s not like you’re just touching a tree, you know. The tree has presence. It has vitality. And some of our people say they can speak to other living things. And there’s a communication there. Whether, I mean, it’s not like you’re sitting around talking to animals like Dr. Doolittle, you know. But there is a communication process! And I’ve been able to observe this, because in my own life, when things were not going well, I would try to practice sitting still. And I felt like, if you sit still, and you observe what’s around you, you feel that sense of connection. You don’t feel alienated or lonely or lost, if you know your place in everything. An openness to look inside, to sit in stillness with others and to work together from the enormous task of the building a village to the sweet, everyday ones such as gathering apples for the harvest. Roots and limbs laden with gold circles. Who ladle into jars an enchantment made by heart. At St. Paul’s church bazaar. Three dollars for a pint. Today’s Elder Wisdom segment featured the Monacan nation. 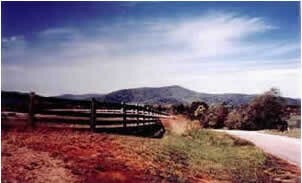 It was upon Monacan ancestral land where Thomas Jefferson established his home, Monticello, just outside Charlottesville, Virginia. Monticello was the site of the 2003 Lewis and Clark bi-centennial kick-off. As the national park service unfolds this commemoration, listen for a special series of Wisdom of the Elders featuring stories focusing upon the culture and history of native nations along the expedition route. I’m Arlie Neskahi. You’re listening to Wisdom of the Elders.